We all know that the hoopla that surrounds Fathers Day is nowhere as big as the one that accompanies Mother’s Day. Sad truth, dad’s while equally important in our lives just don’t get the chocolates, flowers, brunches and phone calls that mom’s do. What they do get is usually a card, a book, magazine subscription and/or maybe few rounds of golf or at the very least a phone call. What they don’t usually get is a great, knock it out of the park, I love you breakfast. This column will change all that by utilizing a little imagination, a few pretty simple, yet unique, readily on hand, ingredients to make your father, dad, daddy and or the man in your life who fulfills that honored place extra amazing pancakes for breakfast on his special day. Making pancakes AKA flapjack, hotcake and/or griddle cake is a very easy project and even the youngest helper can pitch in to get dads day off to a delicious start. Preheat oven to 350. Grease a 9-inch pie plate with butter or nonstick cooking spray. In a bowl combine the apple, raisins, brown sugar and cinnamon. Spoon the apples into the prepared pie plate. Bake the apples, uncovered 10 to 15 minutes or until the apples begins to soften. Remove the apples from oven then bump the oven temperature to 450. In a bowl combine the eggs, milk, flour, and margarine and whisk until combined. Pour the batter over the apple mixture. Bake for 15 minutes or until the pancake puffs up and is golden brown. Sprinkle the top with powdered sugar if using and serve immediately. Serves 4. In a bowl whisk together the flour, baking powder, baking soda, sugar and salt. In another bowl whisk together the buttermilk, mashed bananas, pecans, chocolate chips, eggs, butter and vanilla. Whisk the dry ingredients into the buttermilk mixture until combined. 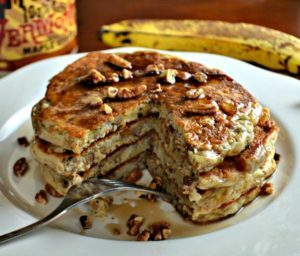 This recipe was sent to me by a reader and she said it was the BEST pancake she ever made. I agree!!! Filling: In a small bowl combine the butter, brown sugar and cinnamon. Place the filling into a sandwich sized self sealing baggie. Close and set aside. Icing: In a medium microwave-safe bowl, heat butter and cream cheese 30 to 60 seconds, just until butter has melted and cream cheese has softened. Whisk in powdered sugar and vanilla and combine until smooth. Set the icing aside. Batter: In a large bowl, whisk together milk, pumpkin, eggs, oil, and vinegar. In a separate bowl, whisk together flour, baking powder, baking soda, pumpkin pie spice, salt and brown sugar. Add the dry ingredients to the pumpkin mixture and stir just until combined. Make sure the filling mixture is combined by squishing the bag a few times. If it’s not as thick as toothpaste stick it in the freezer for a few minutes thickened. Snip off a small piece of the corner of the baggie. To make the pancakes: Preheat a skillet or griddle and grease with butter or non stick spray. Use a 1/4 cup measuring cup spoon pour 4 pancakes onto the griddle. Spread out the batter a circle. Reduce the heat to low. 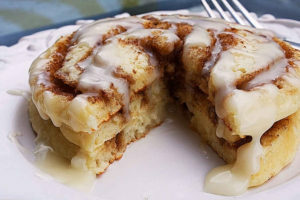 Starting at the center of each pancake squeeze the cinnamon filling on top of the pancake batter in a concentric swirl. Continue cooking the pancakes for 3 to 4 minutes until bubbles begin to appear and pop. Gently flip the pancake over. Cook an additional 2 to 3 minutes, until the other side is golden as well. Place the cooked pancakes on a cookie sheet and keep them warm in the oven while you make the remaining 4 pancakes. To serve, place on a plate or platter and drizzle the cream cheese frosting on top.